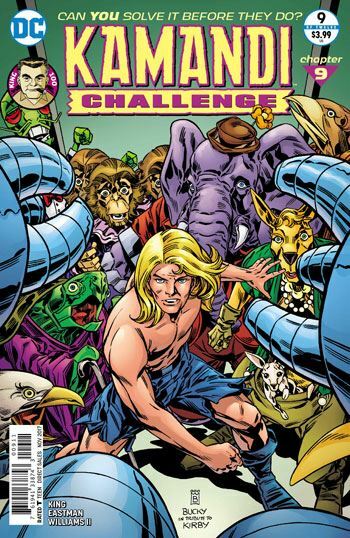 Up to now, the Kamandi Challenge has been a lot of fun. Yes, Kamandi seems to move from life threatening and traumatic event to the next life threatening and traumatic event. Sure, we have seen creatures Kamandi cares about killed off in horrible ways. But all in all, this has been a roller coaster of a series. Tom King brings the fun to a halt here. But I am not criticizing him for that. Eastman and Williams set the story in a grey cave, as bleak as could be. While there is still a considerable amount of detail and expression on the characters, the greyness just adds a horrific intensity to it all. Kamandi is trapped, waiting, along with everyone else, to be taken from the cave by a robot. What happens to those taken out of the cave? Nothing good, that’s for sure. This story is claustrophobic and unsettling. Honestly, it doesn’t even need to be a Kamandi story. One could read this issue, never having read a Kamandi story before, and still be affected by its bleakness. Would I want to read an entire Kamandi series handled this way? No, not one bit. 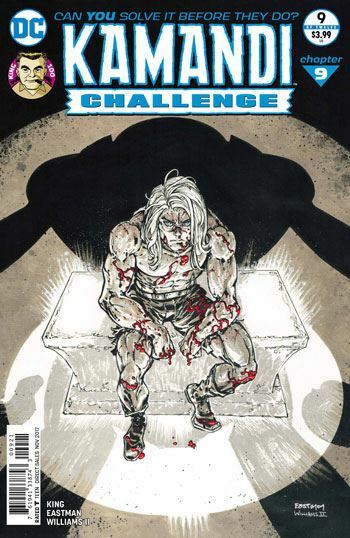 But that’s where something like the Kamandi Challenge is freeing. The creators are able to take the story where they would like to, content that the direction will change with the next creative team. Tom King is rapidly becoming one of my favourite writers, from his work on Batman and Mister Miracle. This issue of Kamandi Challenge just increases my admiration of his talent. While I cannot say that I “enjoyed” the story, it’s far too heavy and dark for that, I certainly admired and appreciated it, and it will likely stay in my head much longer than the other issues of this book.